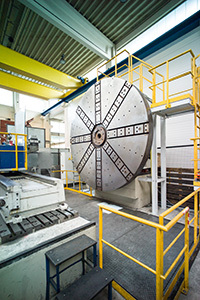 Machining is built on experience: complex and difficult components like impellers and guide rings, housings and structural elements as well as the level of quality of the serial production like drill plates – we have years of experience in using 3, 4 and 5 axis milling technologies and we are able to deliver large components with high machining volumes. This allows us to machine various materials – reliable and efficient: synthetics, Cerrotru, aluminum, low-alloyed steel, high-alloyed steel and hard-to-machine materials like titanium alloys and nickel-based alloys. The processing strategy is specifically designed for the respective quantities and complexity of the individual client requirements and the contour demanded. 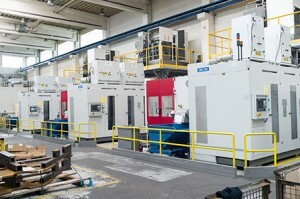 We use leading CAM systems for the programming of your components. 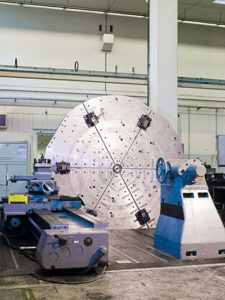 CNC turning at the horizontal lathe – even large components up to a diameter of 8.000 mm – and 6 axis grinding complete the range of the machining process range.